This 20 inch High Quality Harley-Davidson Neon Clock is licensed and features Harley-Davidson's nostalgic, classic trademark Bar & Shield logo. This quality neon clock is twenty inches in diameter and weighs fifteen pounds. This clock is hand-crafted and MADE IN THE USA. The manufacturer utilizes premium materials and expert craftsmanship to ensure exceptional quality. It comes with a one year limited manufacturer warranty against defects in materials and workmanship. The twenty inch by five and one fourth inch metal bezel is hand spun with a powder coated wrinkle black finish. The genuine 1/2 inch neon tube is Majestic Orange and lasts over 100,000 hours, which is more than 11 years! The 5/32 inch black lined crystal glass protects the clock face, hands and sweep while the black lines provide a nostalgic look and feel. The hands are orange and the smooth motion sweeping second hand is white. The clock has a separate set stem, an eight foot 110-volt power cord and a separate neon light switch. Again, this a super high quality clock - not like the cheap knock-off clocks made in Asia. This hand crafted clock is made with pride by American hands. 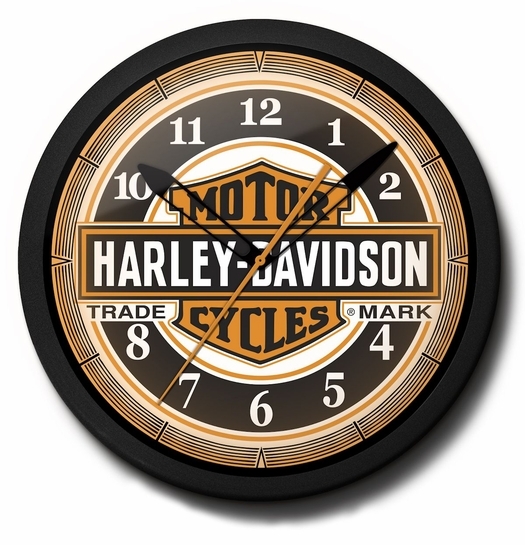 We have this same high quality Harley-Davidson neon clock hanging in our office. We highly recommend it! If you are a Harley enthusiast, we highly recommend a visit to the HDForums. The discussions on the HDForums forum cover a wide range of current topics related to the Harley-Davidsons. You will definitely enjoy it. 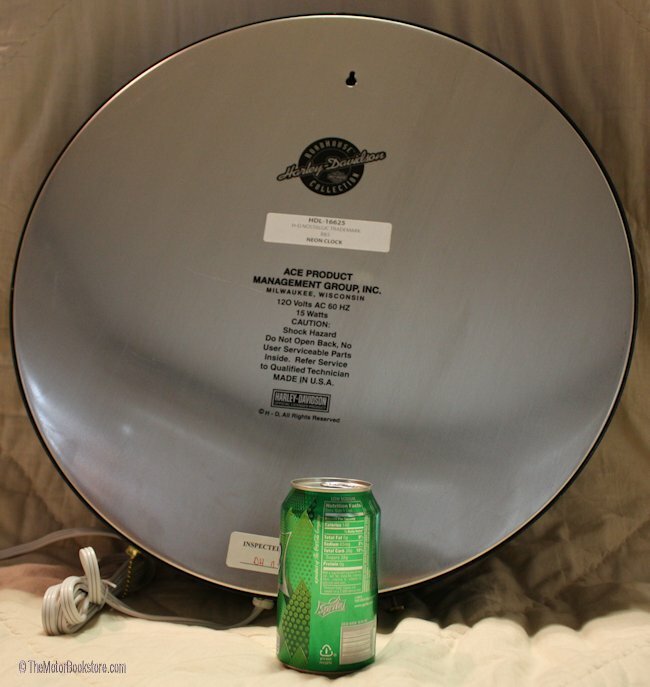 Below: The following photos illustrate the size and quality of the Harley Davidson Neon Clock as it relates to a 12 ounce can. If you are a DIY'er, TheMotorBookstore has one of the best collections of Harley-Davidson Service & Repair Manuals. 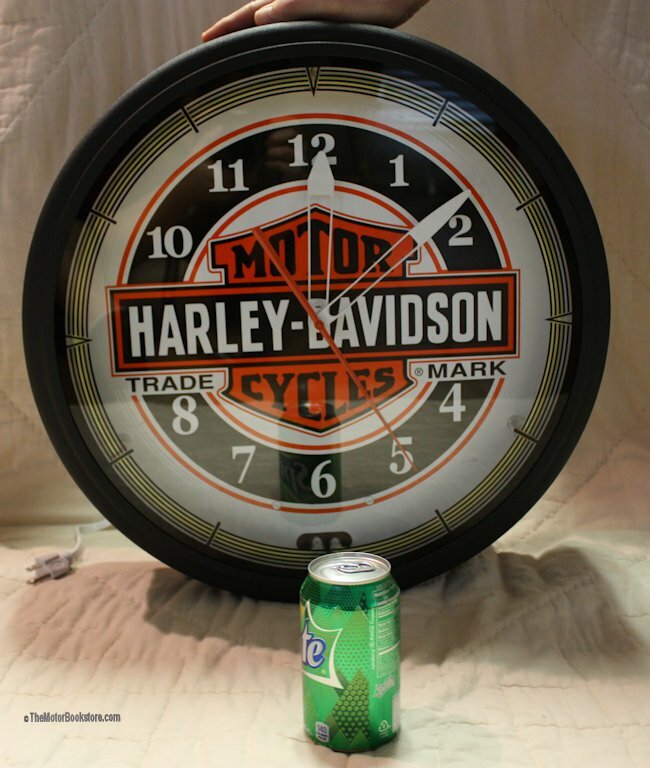 Ask a question about Harley-Davidson Neon Clock: High Quality, 20 Inch. Arrived as promised, packing for shipping was top notch. Just what I was looking for - can't wait to give as gift. This gift should last for years. Great price. Thanks to The Motor Bookstore.